Don't you sometimes wish, while watching an over-the-top romance scene in a movie, you could put words in the mouths of actors? Well, now, thanks to McDonald's, you can. Or at least you can see on person's version courtesy of this Rob Tenconi-penned McDonald's commercial from Leo Burnett London. Come on. You know you fantasize about this every time you see a scene like this in a movie. Don't you? Oh wait, you don't? It's just me? Damn, I really do have some kind of obsessive ad-fueled syndrome. Hmm. Must be the result of trying to read Advertising Age, AgencySpy, Adland, AdFreak, AdWeek, AdScam all while frantically updating my Facebook status, tweeting relevant bits to Twitter followers, IMing with tipsters and swimming in a sea of endlessly updating RSS feeds. Yea, that's it. Melodramatic narrative and epic "nature's wrath!" scope sets you up for the punchline of DNA's "Geologic." Lest thrill-seekers forget: those treacherous crags rising up to the sky? They are there for the benefit of your skis. Upon returning home from a business trip, it's sometimes nice to get a follow up email or card from that special new friend you met while engaged in activities entirely unrelated to business. The recipient in this commercial for Snapily is quite proud of himself when he receives a card from Tiffany, the girl he met on his last trip to New York. Quite proud indeed. That is until his co-worker points out something that could only be described as unexpected. Keta Keta created. Dupont Wants to Take You To Funky Town. What's With All the Synchronized Swimming in Ads? Couple things about featuring synchronized swimming water ballet in ads: First? Don't. Second? Don't. Unless they look like the real U.S. Olympic synchronized swim team pictured here from a Radar gallery, or you're going for laughs like the Klassic Martin Short SNL skit. (Back when SNL was funny.) First came Nuva's real fake fakery. Then someone said, "You know what this needs? More realer real." Now comes Vick's. As much as I hate to kill the vibe from last night's election results, we must never forget, so that this never happens again, in times like these. Be warned: Some poses in this spot are just plain wrong. It's Official: Brits Love Bush. "Baphomet and Minotaurs are two different things. Baphomet has wings and the head of a goat. A Minotaur is a bullheaded man." I knew that. Of course, that was in response to the commenter before them that thought Baphomet was real. The What the...? factor x 10 is in full effect here. So is the push to convince you how great on gas it is. Timeout. Sure gas prices have dropped lately, but 24 mpg ain't that great. More importantly, is that really all you wish for in an SUV? Let's try a plasma TV, Slash riding shotgun on the way to his private party and never having to stop for gas along the way because it gets 110 mpg. Now we're done. 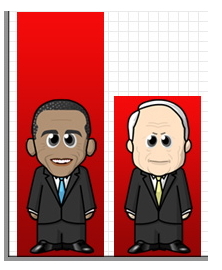 - Obama/McCain WeeMees! OhMG kyoooooot. Diggin' how the page reads, "Invite the presidential nominees to your Room." So naughty. - Speaking of politics, that half-hour Obama ad pulled in an average household rating of 21.7. The top market was Baltimore, where it averaged 31.3. - Still undecided? Sport it on your coffee cup. $10 says at least five election canvassers will make a beeline for you within minutes of exiting 7-Eleven. - Zap bugs with Honda. Reminds me of a Stargate SG-1 episode where these giant bugs would prick you, then turn you into an egg sack.